I’ve been writing posts and keeping them in my drafts because I feel so incredibly self-centered talking about me, me, me all the time. Especially with everything going on in the world. But guess what? Here’s another post about me. I tried checking out the Daily Prompts. There was one I liked about a mystery bouquet of flowers showing up for you with no card. The prompt read: You return home to discover a huge flower bouquet waiting for you, no card attached. Who is it from — and why did they send it to you? I thought maybe I’d write a cute post but I couldn’t decide if the flowers came from The Rock or Derek Jeter. I struggled, people, because you know, this could happen with either man. Then I thought I’d try the trio one: Today, you can write about whatever you what — but your post must include, in whatever role you see fit, a cat, a bowl of soup, and a beach towel. This conjured creative writing vibes about a crazy cat who sleeps on a beach towel because he really wants to live on a beach, then he eats a magical can of soup and he’s transported to St. Thomas and lives happily ever after. Still, didn’t feel like expounding on that beyond what you’ve just read. Next I pondered writing about Scandal or Empire, but I haven’t been keeping up with new episodes. What fun would that be for you? I have a post about the awesomeness of Carol from The Walking Dead in my saved drafts, but I don’t think it’s a good enough homage. So while I didn’t want to write another post about my writerly stuff, honestly, it’s all I have going on right now outside of work and family. I guess the nature of having a blog is that it is about you (me). I’m allowed to be self-centered here. I hope that someone takes something away from the post, whether it be a smile or a tidbit or even a relaxing minute, using the time it takes to read as a little escape. So yeah. This is about me. Again. If you want to “x” out of this, I understand. If not, read on! Two writing-related things happened this week that I’d like to share. First, as I’ve mentioned, my book The Love Square releases from Limitless Publishing on January 12, and guess what? I got my cover and I LOVE it. It’s perfect! I’m not going to reveal it here today. I’ll reveal it soon with a little “pomp” (which happens to be one of JC’s vocabulary words this week. Pomp= ceremony and splendid display, especially at a public event). Also in TLS news, I learned the book will go up for pre-sale on January 2–what a way to start the new year! I won’t believe it until I see it on Amazon, but getting the cover did make it seem more real. Happy event number one: finalizing my cover with the patient and enthusiastic team at Limitless. 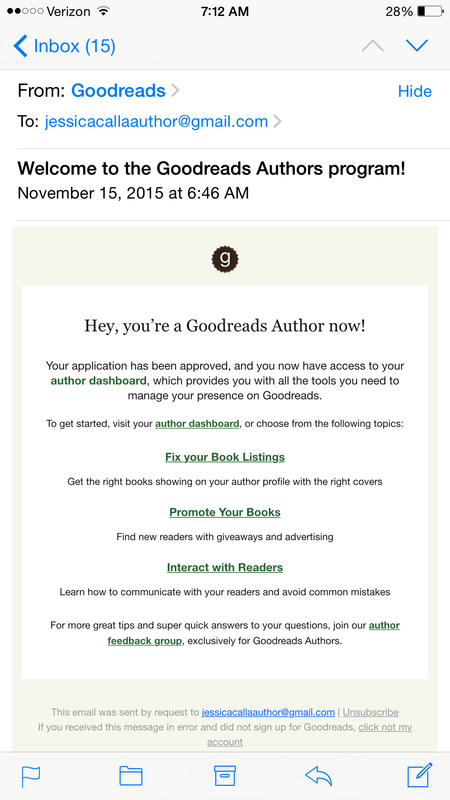 Happy event number two: I’m discovering the joys of marketing and wanted to explore Goodreads Author pages. In order to get an author page, you have to search for your book and verify that you’re the author. As a goof, I looked up “The Love Square” and guess what? It’s THERE! Not only is The Love Square listed, but so are She Laughs in Pink and She Runs Away, my New Adult series being published with BookFish Books next year. Really? You’re letting me into the club? For some reason, seeing this email made me all gushy inside. I’ve accomplished a lot of writer things in the past few months: submitted manuscripts, fielded rejections, attended conferences, signed contracts, drafted synopses and bios and cover requests. But this silly email almost had me in tears. Now trust me: my social media presence needs a lot of work. Twitter’s my favorite social media game (@jess_calla). I’m still learning Goodreads (which I love) and Facebook (which I hate). Once my cover for The Love Square is revealed in all its “pomp,” I’ll add that to the Goodreads page. I’m also consulting with a web designer to spruce up my author website. I’m excited about everything and I enjoy mingling on the interwebs. As this author gig unfolds, I’d like to figure out how to reach people to sell books. If anyone has suggestions, I’m open to advice. Thanks for reading and have a great rest of your evening! That is so nice to hear, thank you Jess! This is so hugely exciting. You have worked diligently and your time, efforts and talents have been recognized. Can’t wait for the world to read your published work. Awww *blushes*- thanks my blogging buddy! I’m lucky you let me read your stuff and can’t wait til you are unleashed on the world !